Lake Garda is one of those iconic beauty sports with its turquoise blue waters framed by mountains rising steeply upwards with their peaks topped with snow. In summer the place gets extraordinarily busy as coaches bring in an endless stream of tourists choking its narrow roads. But in spring, when the season is just getting started, it’s mercifully quiet and temperatures are warm enough to hike in shorts and tee shirt. 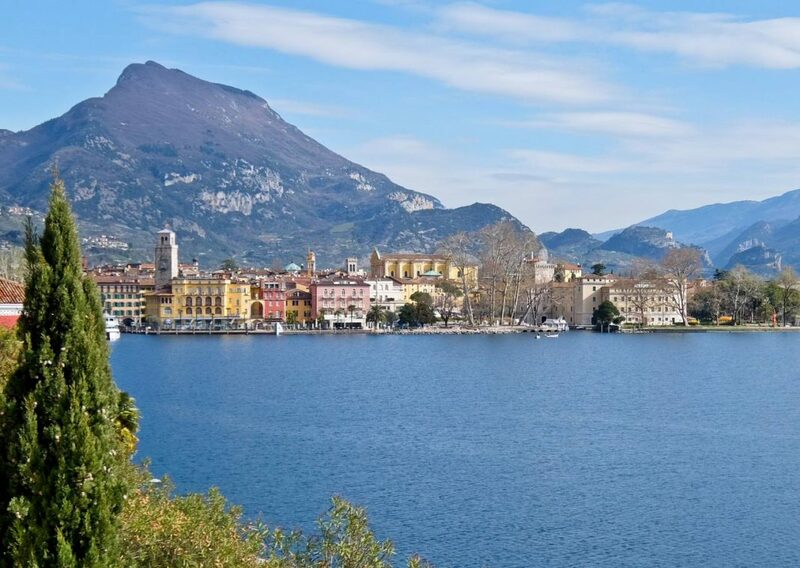 I base myself in Riva del Garda, the northernmost town on the lake, at the foot of the Alps. Dramatic daunting cliffs rise up on either side looking at first almost impenetrable but closer inspection reveals narrow paths etched into their sides. It’s these that I’m going to be following over the next few days. 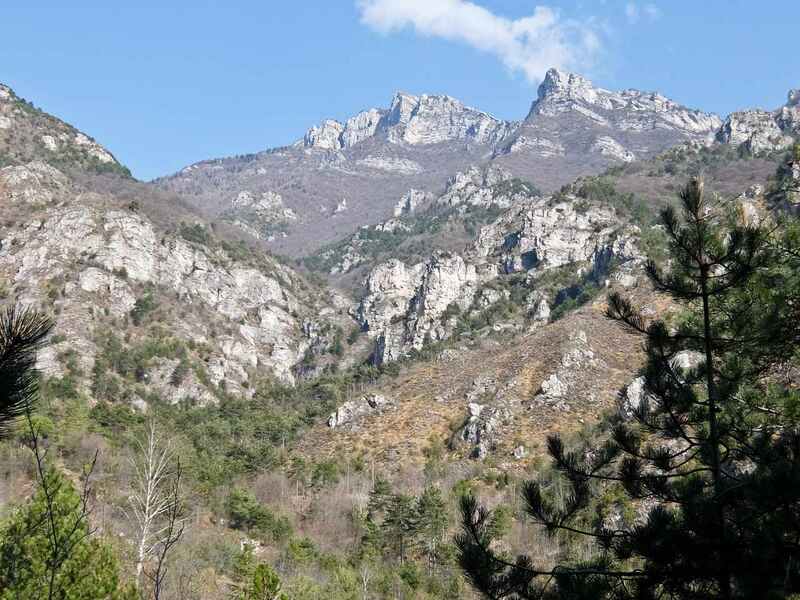 I can see one, impossibly working its way up along the Western edge of the lake, the Strada del Ponale, and that’s going to be my starting point. Apparently it was constructed in the 1840’s by entrepreneur Giacomo Cis but he died before it was completed in 1851. The modern road runs along the lakeshore through a series of tunnels and I turn off to start climbing. Unfortunately there’s a sign saying that it’s closed due to renovations and I can’t proceed. Instead I go and collect my car and drive to the beginning of the path I was planning to reach after the Strada del Ponale. I park by the Regina Mundi Madonna statue, staring out across the lake, and leave the road to follow the old route zig-zagging down the hillside. It turns abruptly and then starts to climb, following the Ponale valley inland on a cobbled road past a shrine and the remains of a mill. I reach the road again briefly before a steep ascent through woodland, passing a series of trenches from WW1. This was the front line of the Austro-Hungarian Empire and the mountain was strongly fortified. 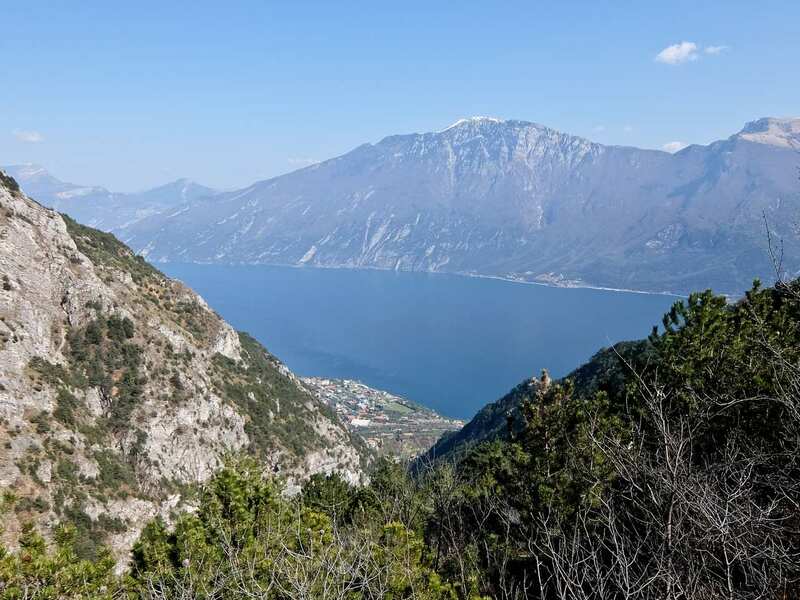 I reach the saddle Bocca da Le at 800m and am rewarded with terrific views over the lake. Then there’s a further scramble up to the summit of 859m Monte Nodice riddled with fortifications. To reach these the soldiers cut a spectacular series of steps into the rock, the Scala Santa, and I take these down to the village of Pregasina, where I sit and enjoy a well-earned beer on the terrace of the Hotel Panorama. Below me wind-surfers and yachts are taking advantage of the afternoon breeze on the lake. It’s a short walk downhill back to my car. Next day I set out in the opposite direction to the village of Torbole following the lakeshore east. It’s too early for the wind-surfers as the lake is like a mirror, but joggers and cyclists are out in force. After 45 minutes I reach Torbole and take the scalinata, a flight of steps up through olive groves much admired by Goethe. This leads through a Parco Avventure, designed for kids on mountain bikes, to the start of the Sentiero Panoramica Busatte-Tempesta, a path running 200m above the lake. It leads through a Mediterranean oak forest, fragrant with aromatic plants and the spring flowers are just beginning to appear. It’s easy walking, made even simpler by a series of raised iron walkways that bridge sheer rocky outcrops that would otherwise be impassable. After an hour I’m just above the small lakeside village of Tempesta where there’s an option of catching the bus back. 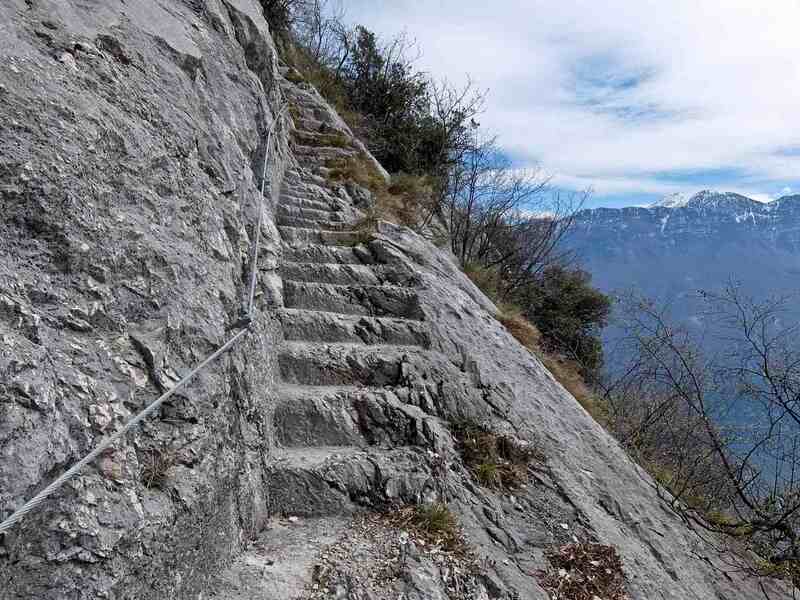 Instead I climb higher up the mountain and make my way back to Torbole on a parallel path. I can appreciate the thinking of the military planners as there are unbridled views of the surrounding area. Another fort, the Batteria di Mezzo guards the upper half and the summit is crowned with an array of radio masts protected by wire fences. I make my way down through olive groves planted above half hidden bunkers. After WW1 this part of Austria became the Trentino and part of Italy and the fortifications never saw battle. For my final walk, I’ve saved the most difficult for last. 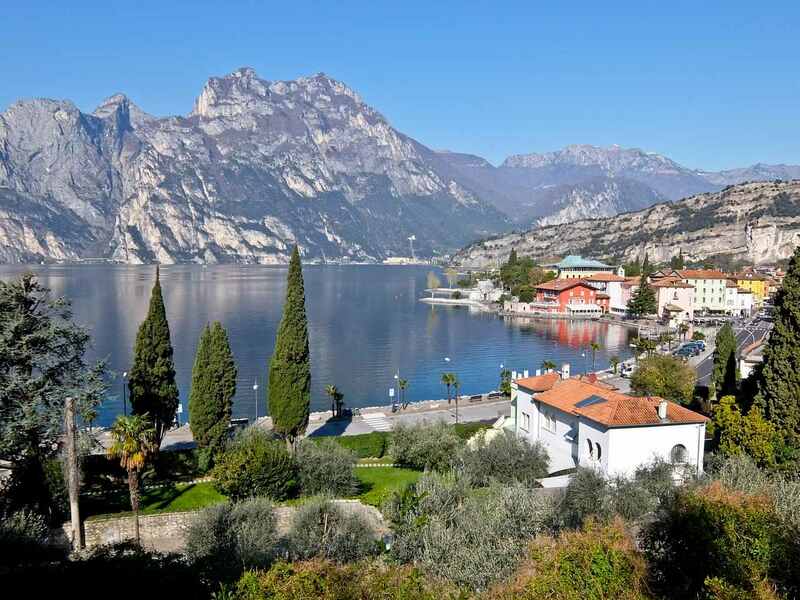 It’s a beautiful sunny morning as I drive 15 minutes south along the western shores to the beautiful village of Limone sul Garda. 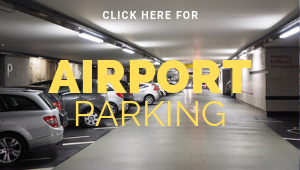 Space is at a premium here and the parking is expensive but it can’t be helped. Soon I’m following a stream up the Valle de Singol on a cobbled road. It’s steep and the mountain crags tower above me and I branch off left up though conifers. The guidebook warns me about an exposed ledge and sure enough there’s a short section where steel cables provide essential support. I’ve no head for heights but am soon zig-zagging my way up to a beautiful grassy clearing at 880m. This is really the end of the climbing and the path continues mainly on the flat through oak forests to a ruined church at Dalco. It’s pleasantly soft underfoot and a sunken lane leads to a signpost at Dega. Now comes the steep descent, across gullies of scree, slightly unstable before hitting a wider stone path which twists and turns downhill. Below I can see Limone, sprawling by the side of the lake and in front are the snow covered peaks of Monte Baldo. I reach the road at Campaldo and continue down to the lake. The descent takes around an hour but I’ve enjoyed every minute. It’s a stunning end to three days of fantastic walking. 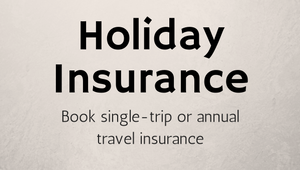 PACKAGE: Prestige Holidays has a four night stay departing London Gatwick on 14th May with EasyJet to Verona, Group B car hire from airport to airport and accommodation at Grand Hotel Liberty on B&B from £529 pp. 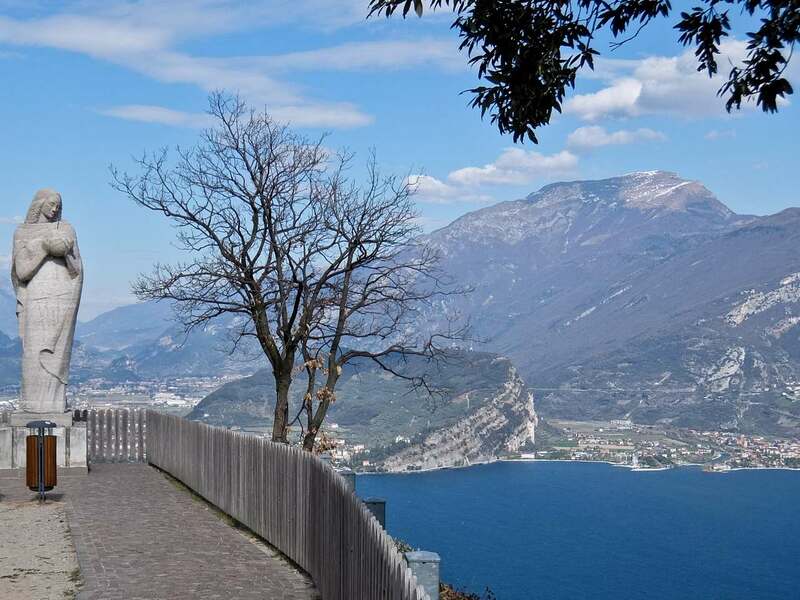 All the hikes feature in the guide book Walking Lake Garda and Iseo published by Cicerone.